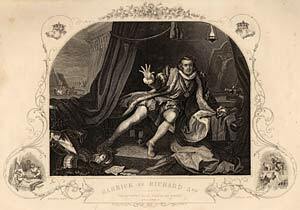 In 1737 David Garrick, aged 20, set off from Lichfield in Staffordshire for London with his friend and former schoolmaster, Samuel Johnson. They were in search of fame and fortune. Both achieved fame and Garrick a fortune. He was to become one of the most successful actor/managers in the history of the English theatre. In 1753, by now living in Covent Garden with his wife Eva Maria, he began searching for a country house, suitable for a gentleman. 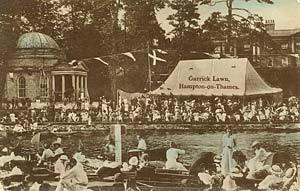 In January 1754 he first took a lease on and later bought what was then Hampton House and is now known as Garrick’s Villa. Within two years Garrick had commissioned a redesign of the façade of the house from Robert Adam and a small octagonal summerhouse for the riverside lawn which lay on the other side of the main road from Kingston to Staines. One of Garrick’s great achievements was to restore the reputation of Shakespeare as a playwright – and so he called his summerhouse ‘The Temple to Shakespeare’. It is classical in style with a deep portico with Ionic columns. The architect is unknown. Robert Adam, Capability Brown (who certainly designed the Temple gardens) and the sculptor Roubiliac have all been suggested. But it is clearly inspired by a similar building in the grounds of Chiswick House, one of the homes of Lord and Lady Burlington. Eva Maria was closely associated with the Burlington family and she and David spent their honeymoon in Chiswick House – so it’s possible that a local builder and Garrick himself designed the Temple with Chiswick in mind. In the Temple the Garricks dined, supped and entertained their friends. Once a year Garrick distributed cake and money to the poor children of Hampton, seated in the Temple on a chair designed by Hogarth containing a medallion of Shakespeare carved in mulberry wood from the tree in Shakespeare’s garden. 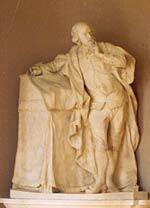 But pride of place in the Temple was given to the marble statue of Shakespeare, in its own alcove, carved by François Roubiliac. At the age of 61 Garrick died, to be outlived by Eva Maria by over 40 years. On her death in 1822 the statue was bequeathed to the British Museum but the Temple remained a treasured part of the estate throughout the nineteenth century. In 1923, after some years of neglect and occupation of the house by the army during the Great War, Garrick’s Villa was converted into apartments and the Lawn was sold to a Paul Glaize of Tagg’s Island. He built a large house on the lawn that abutted onto the Temple itself. Such was the local outrage that in 1932 Hampton Urban District Council (as it then was) bought the Lawn and the Temple and demolished Mr Glaize’s house. Since then the Temple and the Lawn have been Council property. In later years, despite the best efforts of the Council and local residents, the Temple fared poorly from vandalism and the theft of lead from the roof. In the 1990s, thanks to the work of the Temple Trust and local volunteers and grants from English Heritage and the Heritage Lottery Fund in particular, the Temple has been restored and refurbished as a memorial both to Shakespeare and to David Garrick. The Temple is now administered by Garrick's Temple to Shakespeare Trust, the objectives of which include conserving the Temple, and extending its use for cultural and educational purposes. The Temple is open to the public from 1400 to 1700 every Sunday from April to October inclusive, and for public events throughout the year. It is also available for appropriate private events. For further information see the website www.garrickstemple.org.uk .